The official government narrative of 9/11 is “uncertain” but Osama Bin Laden was likely involved, Princeton University professor Dr. Cornel West said while speaking at the Million Muslim March in Washington D.C.
YouTube by Civil Information Activist Doug Brinkman - http://www.ciactivist.org/: EDMONTON August 11, 2013: Not only did the Edmonton Folk Festival have 5 consecutive years of 9/11 truth actions outside her gates but in this city of summer festivals Heritage Days last weekend also saw it's 5th consecutive year on 9/11 civil information actions.Next week the Fringe Theatre Festival will also see it's 5th consecutive year with 9/11 truthers outside it's gates too. Over the years other festivals where civil information actions took place included the Street Performers Festival, The Works arts festival, The Art Walk and last year for the first time outside the gates of the Interstellar (music) Rodeo. 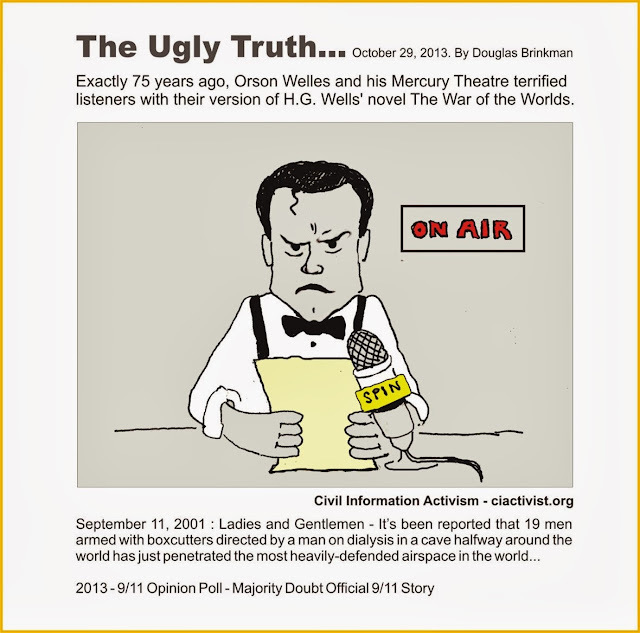 These festival civil actions along with regular Farmer's market 9/11 truth actions puts the famous words of former media tycoon Izzy Asper to actions "If you want the public to hear you once, you have to say what you're saying five or 10 times." Niels Harrit is the Associate Professor for the Department of Chemistry at the Copenhagen University in Denmark, who has published a large number of scientific papers with a special focus on nano-science. He was part of the scientific team which discovered nanothermite in dust samples from the 9-11 World Trade Center attack. In the first hour, he’ll discuss his scientific opinion on the collapse of the WTC and also WTC building 7. Niels tells his story as an independent researcher investigating 9-11 wreckage. He explains why he thinks nanothermite was at work. In the second hour, we discuss the official scientific report of the 9-11 disaster. He speaks more on the strange materials found in the rubble. Later, Niels discusses the loss of civil rights due to the events on 9-11. As a Danish citizen, he talks about the obstacles he faces when discussing the truth about the 9-11 attack. Letter to the Hartford Courant Re- 9/11 Truth "Anti American Hate Speech"
Hartford Courant: Scrub 9/11 Graffiti : Is it possible that the state of Connecticut could use some of that $500 million from the Ctfastrak project and throw some coats of paint on the bridge supports that run through downtown Hartford? I'm sick and tired of driving by underpasses and seeing "9/11 Truth" graffiti. The good citizens of Connecticut deserve better than seeing anti-American hate speech rubbed in their face every day. 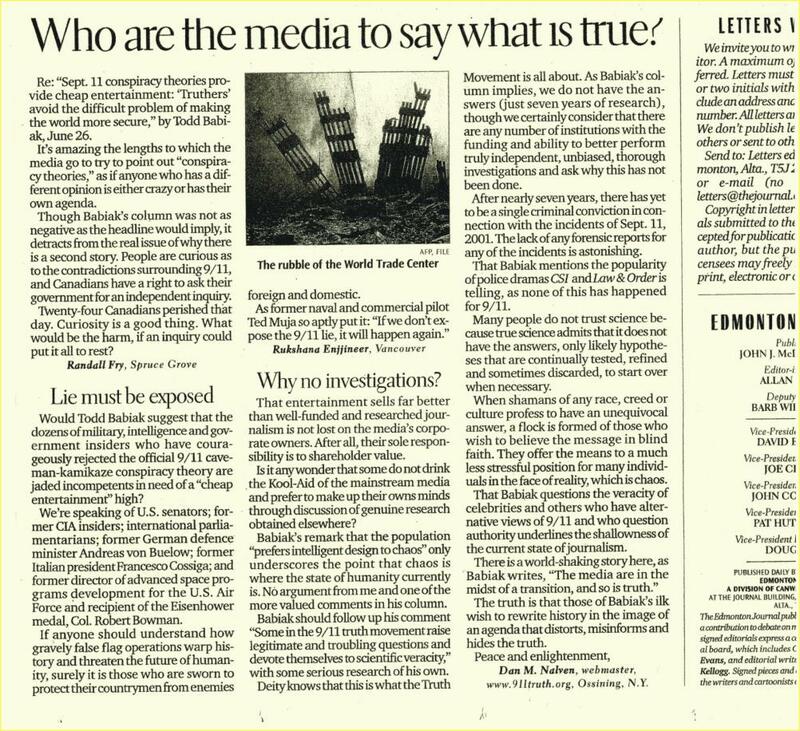 Friends of 9/11 Blogger - What are your thoughts re- this letter found in the Hartford Courant May 6, 2013? Is 9/11 Truth anti American, is 9/11 Truth hate speech? Poloz has made other arguments that are even more likely to raise eyebrows. 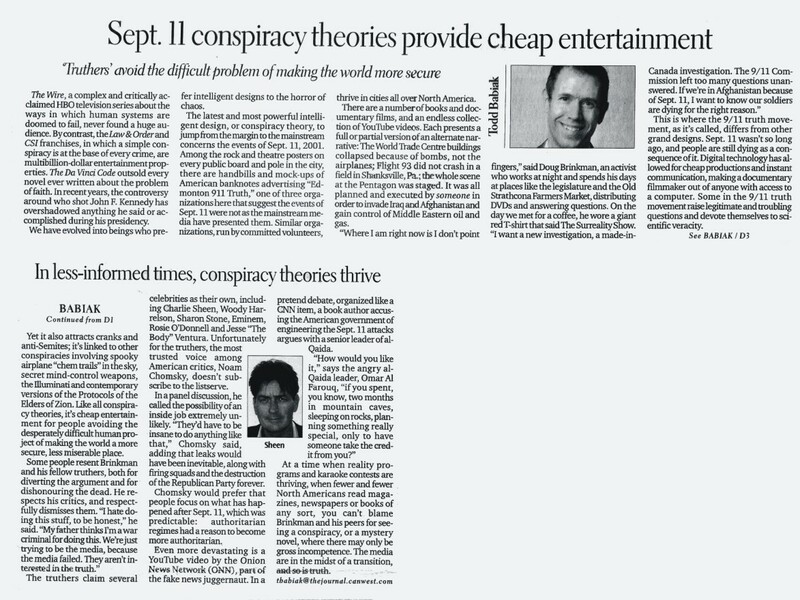 As the financial crisis unfolded in 2008, he wrote an article positing a very interesting theory for what caused the crash: Blame 9/11, he said. Well known 9/11 Truther Jack Blood formerly of American Freedom Radio has never been a fan of "Civil Information Activism" as he would rather you get mad and scream at the top of your civil resistance lungs "9/11 WAS AN INSIDE JOB!" like his hero and friend the late John Boncore aka "Splitting The Sky" who spent a night in jail for his own protection after his reckless grandstanding at trying to break through a Calgary police line to get at former President George W. Bush. 9/11 Truth "CIVIL INFORMATION ACTIONS" are planned for this Saturday April 20, 2013 during the annual 420 rally and mass civil disobedience by protesters demanding the decriminalizing of marijuana possession laws in Canada. We still have stock-piles of ae911truth street ready brochures donated by supporters in Edmonton from my 2011 petition drive the brought in 900 plus signatures calling for a made in Canada public investigation of 9/11. These brochures will be shared with 420 protesters that's traditionally attended by thousands. (see past 420-911 Truth action - YouTube video) Other 9/11 Civil Information actions are being planned for Farmer's Markets info pickets and outside the gates to annual festivals such as Heritage Days, Folk Fest, Cariwest parades and as always the highly attended Fringe theatre festival in Edmonton this summer. Published on 12 Apr 2013 by Paula Che Kirman: EDMONTON, AB, CANADA : Mohammad Mahjoub tells his story on April 11, 2013 at the Telus Centre on the University of Alberta campus. Presented by APIRG and ECAWAR. For twelve long years, Mohammad Mahjoub, a torture survivor, has been detained without charge in Canada. He was held for lengthy periods in solitary confinement and later under house arrest -- all on the basis of secret information which the Canadian Security Intelligence Service (CSIS) has admitted was likely obtained under torture. Finally, after twelve years, Mr. Mahjoub is permitted to travel outside Toronto, and he is bringing his demand for justice to the home base of Prime Minister Stephen Harper. Mr. Mahjoub is one of five Muslim men who have been struggling for justice in Canada against so-called security certificates. Security certificates allow the government to indefinitely detain or deport people on the basis of their profile. He will tell his story as his speaking tour, which began in 2012, continues into Western Canada. Good Gosh - Atheists to Finish the Job ? An evangelical lawyer and professor from Jerry Falwell’s Liberty University on Wednesday warned that atheists were trying to “finish the job” that terrorists started when they attacked the United States on Sept. 11, 2011. 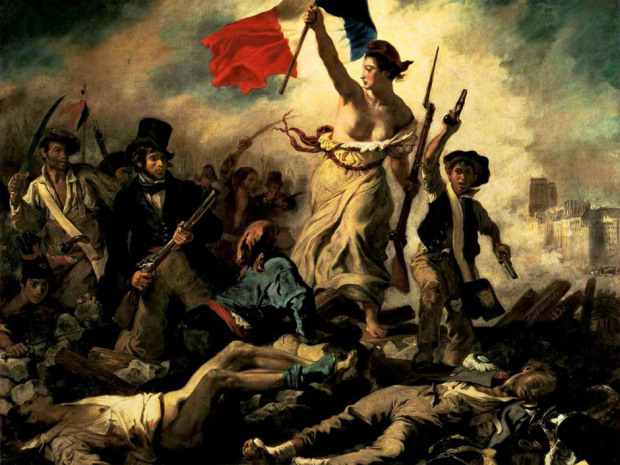 Canada's National Post Reported "9/11 Truther vandalizes Delacroix painting at the Louvre"
According to Le Figaro newspaper, the woman wrote “AE911″ near the bottom of the canvas. The inscription stands for “Architects and Engineers for 9/11 Truth,” a group of individuals who believe George W. Bush is responsible for the collapse of the Twin Towrs in New York City on Sept. 11, 2001. 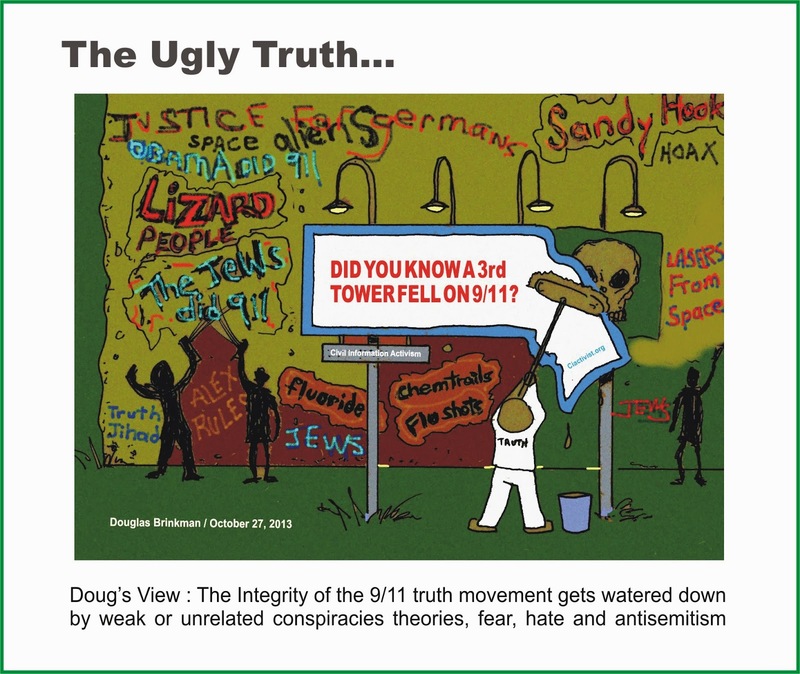 The group comprises architects, engineers and demolition experts who believe there is empirical evidence to suggest 9/11 was an inside job.